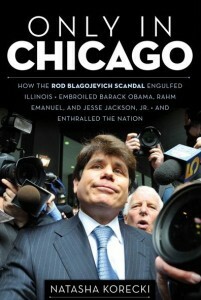 On the left is a photo of me (snapped by April 14, 2009, by Chicago Sun-Times photographer Brian Jackson) seemingly yelling at Rod Blagojevich. The former Illinois governor had just exited Chicago’s Dirksen Federal Building where he had entered a “not guilty” plea to a wide variety of corruption charges, including the allegation that he had attempted to market, for personal gain, the seat in the U.S. Senate left vacant when Barack Obama was elected President. I was part of the media scrum (a correspondent for the “Chicago Tonight” show which airs on WTTW, one of Chicago’s public television stations) that pursued Blago that day: and, to be quite frank, I only appear to be yelling at the disgraced former governor: in reality, I was trying to locate my camera operator who had disappeared into the crowd, nowhere to be seen.